PASADENA, Calif. - Late Monday night, an image from the High Resolution Imaging Science Experiment (HiRISE) camera aboard NASA's Mars Reconnaissance Orbiter captured the Curiosity rover and the components that helped it survive its seven-minute ordeal from space to its present location in Mars’ Gale Crater. "This latest image is another demonstration of the invaluable assistance the Mars Reconnaissance Orbiter team, and its sister team with the Mars Odyssey orbiter, have provided the Curiosity rover during our early days on the Red Planet," said Mike Watkins, mission manager for the Mars Science Laboratory mission at NASA's Jet Propulsion Laboratory in Pasadena, Calif. "The image not only satisfies our curiosity, it can provide important information on how these vital components performed during entry, descent and landing, and exactly locate the rover's touchdown site within Gale Crater." 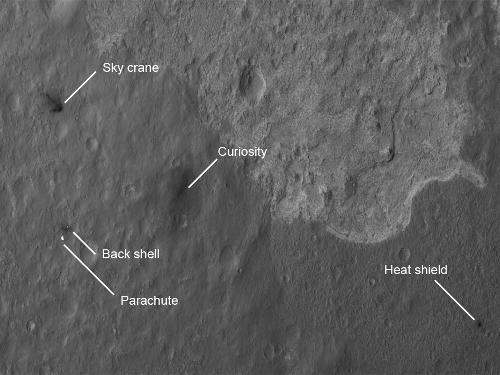 The Mars Reconnaissance Orbiter's image of Curiosity and its parachute, back shell, heat shield and descent stage can be found at: http://go.nasa.gov/OXjKz6. The Curiosity rover is in the center of the image. To the right, approximately 4,900 feet (1,500 meters) away, lies the heat shield, which protected the rover from 3,800-degree-Fahrenheit (about 2,100 degrees Celsius) temperatures encountered during its fiery descent. On the lower left, about 2,020 feet (615 meters) away, are the parachute and back shell. The parachute has a constructed diameter of 71 feet (almost 21.5 meters) and an inflated diameter of 51 feet (nearly 16 meters). The back shell remains connected to the chute via 80 suspension lines that are 165 feet (50 meters) long. To the upper-left, approximately 2,100 feet (650 meters) away from the rover, is a discoloration of the Mars surface consistent with what would have resulted when the rocket-powered Sky Crane impacted the surface. "This is the first of what I imagine will be many portraits HiRISE will be taking of Curiosity on the surface of Mars," said Sarah Milkovich, HiRISE investigation scientist at JPL. "The image was taken Monday at about 10:30 p.m. Pacific when MRO was at an altitude of about 186 miles (300 kilometers), and we are getting resolution on the surface down to 1.3 feet (39 centimeters) per pixel." As more of Curiosity’s instruments are coming online, more "first images" are being downlinked from the rover's 17 cameras. The latest to come in is from the Mars Hand Lens Imager or MAHLI. The focusable color camera is located on the tool-bearing turret at the end of Curiosity’s robotic arm. Researchers will use it for magnified, close-up views of rocks and soils and also for wider scenes of the ground, the landscape or even the rover. "It is great to have our first MAHLI image under our belt," said Ken Edgett, principal investigator for MAHLI from Malin Space Science Systems in San Diego. "We tested the focus mechanism and imager and the whole system is looking good. We are looking forward to getting up close and personal with Mars." The first MAHLI image, taken with the dust-coated clear plastic cover over the lens, is available at: http://go.nasa.gov/Qb3l6U. The team plans for Curiosity checkout Tuesday include raising the rover's mast and continued testing of the high-gain antenna. Curiosity carries 10 science instruments with a total mass 15 times as large as the science payloads on the Mars rovers Spirit and Opportunity. Some of the tools, such as a laser-firing instrument for checking rocks' elemental composition from a distance, are the first of their kind on Mars. Curiosity will use a drill and scoop, which is located at the end of its robotic arm, to gather soil and powdered samples of rock interiors, then sieve and parcel out these samples into the rover’s analytical laboratory instruments. HiRISE is operated by the University of Arizona in Tucson. The instrument was built by Ball Aerospace & Technologies Corp. in Boulder, Colo. The Mars Reconnaissance Orbiter and Mars Exploration Rover projects are managed by JPL for NASA's Science Mission Directorate, Washington. The rover was designed, developed and assembled at JPL. JPL is a division of the California Institute of Technology in Pasadena. Lockheed Martin Space Systems in Denver built the orbiter. For more information on NASA’s Curiosity mission, visit: http://www.nasa.gov/mars and http://marsprogram.jpl.nasa.gov/msl. For more about the Mars Reconnaissance Orbiter, visit: http://www.nasa.gov/mro. Follow the mission on Facebook and Twitter at: http://www.facebook.com and http://www.twitter.com/marscuriosity.